Emerald Freight Express is Ireland’s premier Independent Air Freight Forwarder, with 36 years experience in the market. We offer our customers and overseas agents a reliable, cost competitive world class menu of services which are designed to guarantee the highest quality of service, door to door. We offer services to and from Ireland’s main international airports located in Dublin, Cork, Shannon and Belfast. Emerald freight Express offers an extensive range of Air Freight Services to cater for your specific Import or Export requirements. In partnership with our Global Agency Network we can offer you an excellent service 24/7/365 across the globe. As a regulated forwarder certified by the department of transport under Air Cargo security regulations we can fast-track your export shipments with the Airlines to ensure express handling and departure on the first available flight to destination. We have developed a number of unique products within our Air Freight portfolio, details as follows. This service is ideal for time critical shipments where you can rely on us to move your shipment on the first available flight with the shortest transit time to final destination, door to door. In many cases we can achieve door to door delivery on a same day basis/24 hours and we also offer an on board hand carry courier service, if required to meet your service demands. For these types of products we can offer a specialised P1 services in partnership with Lufthansa (Flash) and Air France (Equation) which will guarantee transit to destination within the optimum time scale, door to door. These shipments may require special packaging/dry ice or Envirotainer equipment and we can co-ordinate all these arrangements on your behalf to ensure that your products arrive at destination in pristine condition. This service typically delivers a transit time of 3-4 days to most inter-continental destinations worldwide. Working in partnership with our overseas agents we can co-ordinate door to door delivery including customs clearance at destination to meet your service requirements. This is our deferred economy service which typically delivers a transit time of 5-6 days to most intercontinental destinations worldwide. Our economy service may involve the consolidation of your shipment to reduce the freight costs for your benefit. 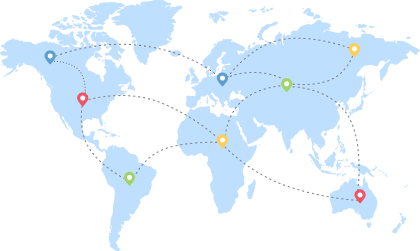 We co-ordinate our consolidations in partnership with our Global Agency Network and as such your shipments move on our integrated system, door to door, across the globe. Emerald Freight Express also offers a full Air Charter Service for special projects to or from any city across the globe. We have a full charter brokers network which enables us to shop the market for the most suitable type of aircraft available at the most competitive prices. We also offer an On Board hand carry courier service for extremely urgent and time critical shipments when security and reliability are paramount. This service is regularly used by our aerospace clients for AOG’s and can be expedited within hours to guarantee delivery within the optimum transit time door to door. For giftware distribution packages moving to the USA we offer clients our online EMFREX shipping system which is a unique solution with many value added features. Emerald Freight Express offers a ULD Air Freight service utilising a wide variety of Airline ULD equipment for both general and Perishable/Pharma Cargo. We also offer shippers the facility to load ULD’s on their premises or at our Santry Hall Terminal. Our staff are duly certified in accordance with the IATA regulations to handle dangerous goods/Haz Mat shipments moving by Air Freight. As such we can help and advise our shippers in relation to packing/labelling and documentation on this type of shipment. On request we can arrange full insurance cover for your shipments at very competitive rates, our on-line system enables us to issue the insurance certificate promptly in association with our Insurance underwriters, Lyolds of London. We maintain all Airline rates on our database including daily spot rates and this enables us to provide prompt quotations to our clients and Overseas Agents to meet your deadlines. We operate from Dublin to all around the globe with our versatile connected and reliable network.